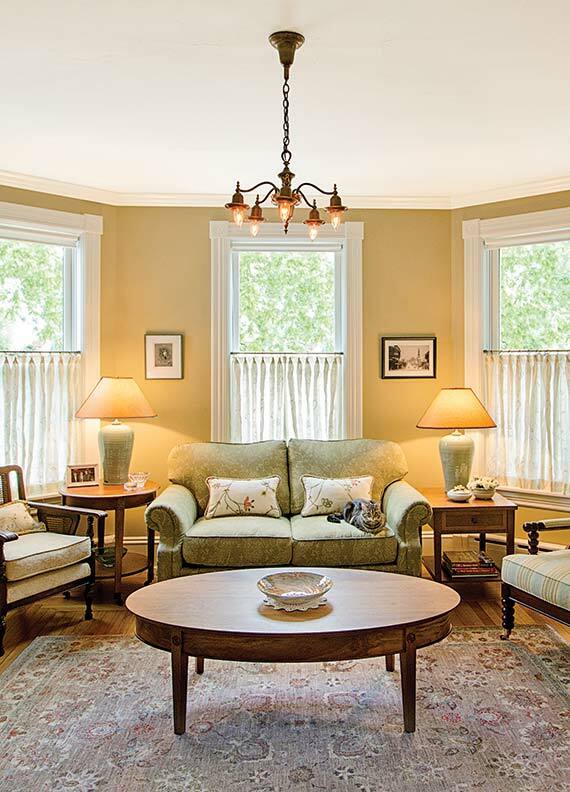 Furnished with period lighting fixtures, antique rugs, and furniture collected by the homeowner, the interior of the 1894 house suits her contemporary life. Situated on a steep hillside above Lake Champlain, Jan’s old house is two and a half stories, about 3,200 square feet inside with a wraparound porch on the front and side. 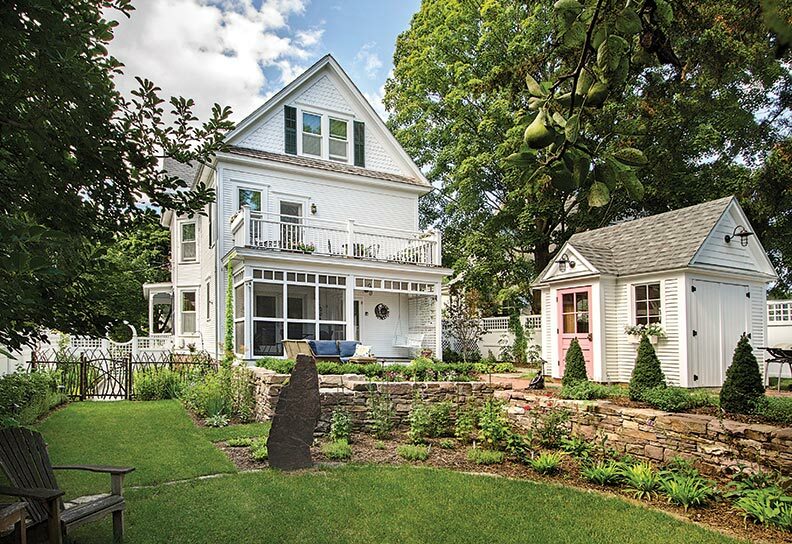 In a late Victorian neighborhood in Burlington, Vermont, this house boasts its original slate roof and fish-scale wood shingles in the attic gable. Fortunately, Jan knew professionals who appreciate old houses. She assembled a team that included architect Bill Maclay, interior designer Cecilia Redmond, and landscape architect Cynthia Knauf. 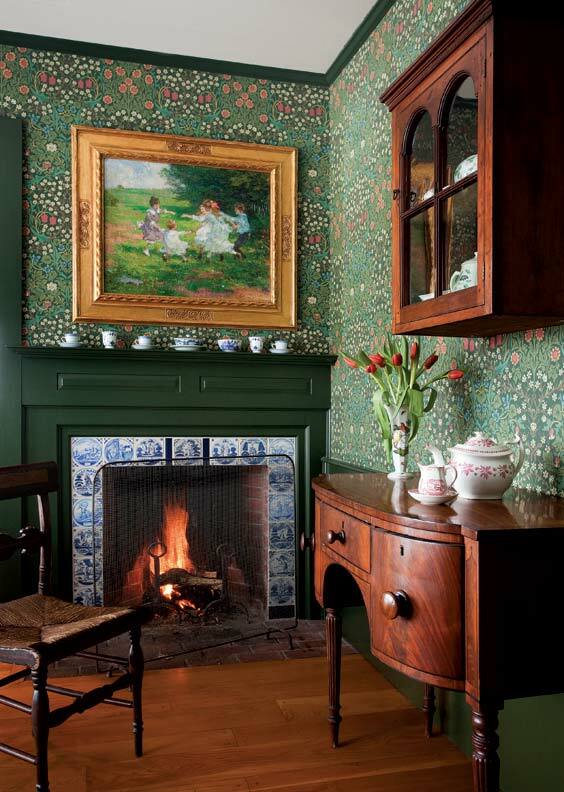 Together, they introduced 21st-century comfort and function into the 19th-century house without obliterating its integrity or its personality. 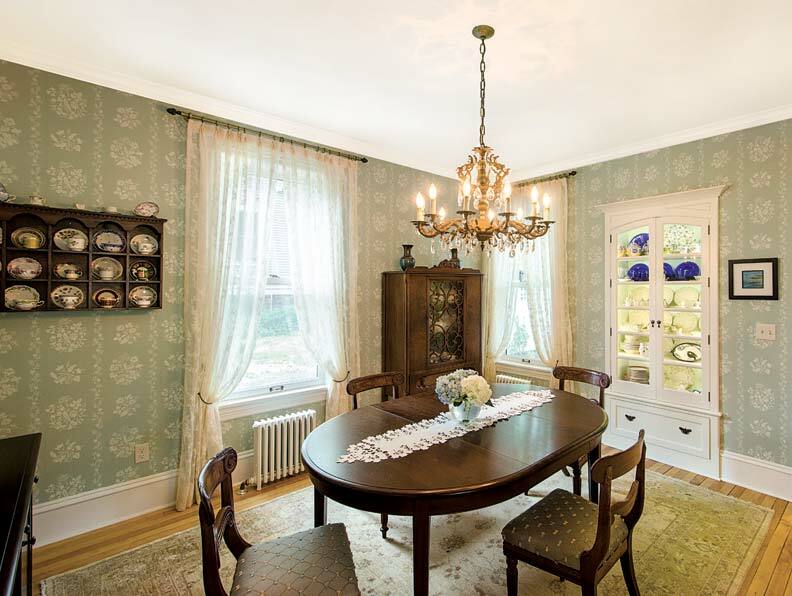 style furnishings mix with soft aqua French-style wallpaper and lace panels. In the case of Jan’s house, the historic exterior was in fine shape. So the inside walls, where little original plaster remained, were taken down to the studs, and foam insulation was sprayed into the double-stud cavity. “We kept all the original trim and hardware,” Bill says. Spray foam was added to existing cellulose insulation at the roof, and the existing stone foundation got spray foam insulation, along with improved drainage. Rotted windows were replaced with wood-clad R5 triple-pane versions. The “deep energy retrofit” brought the heating Energy Use Index from 54 kBTU a year to just 23 kBTU. 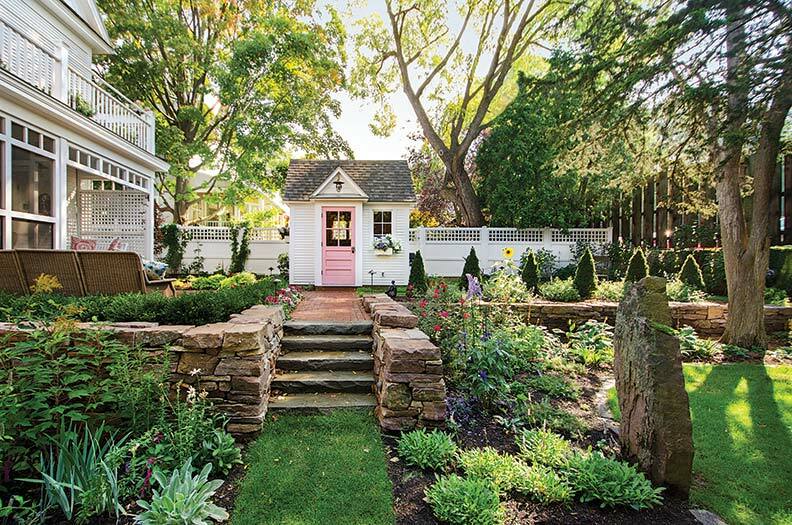 An overview of the rear garden shows terracing and the design relationship among new rear porches, fence, and shed. 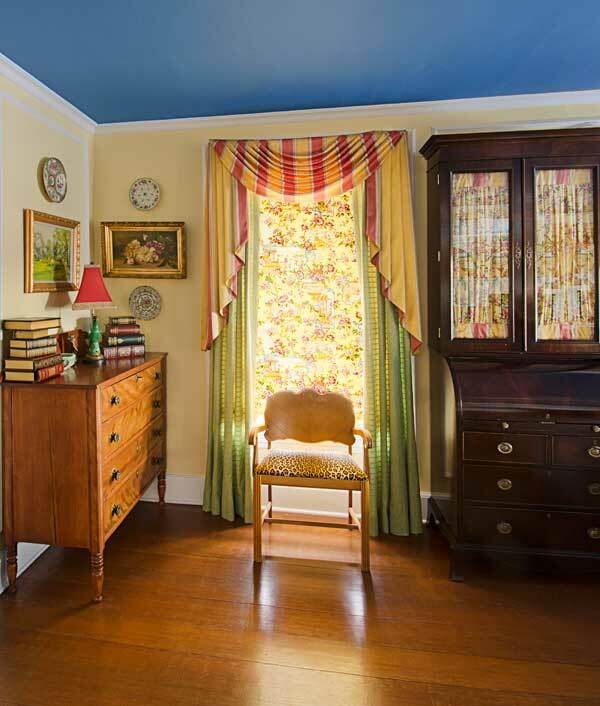 “We did not tamper with the scale and proportion of rooms downstairs,” says Cecilia, who chose muted shades of gold, green, and blue for the interior. For the dining room, she found block-printed Zoffany wallpaper in a lovely aqua that reminded Jan of a dining room she’d seen in a French chateau. 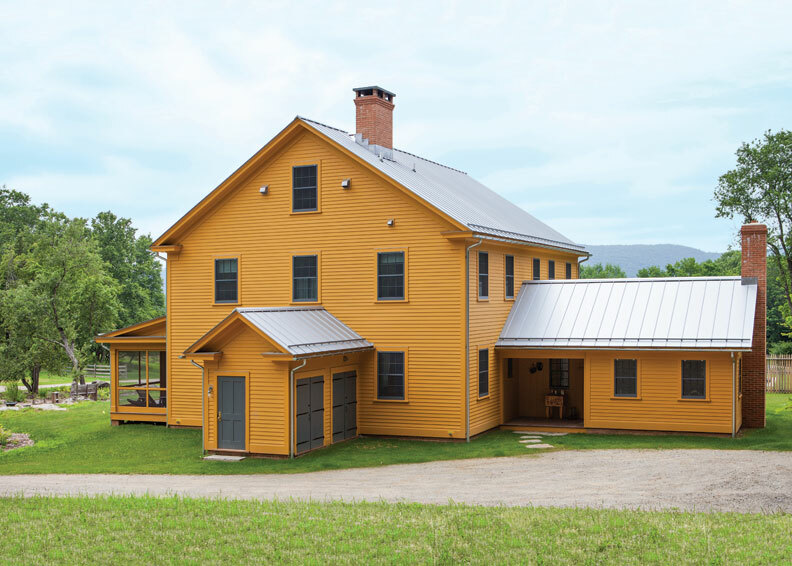 Rafe Churchill designs an eco-friendly new old farmhouse.